Price is per large 55mm x 26mm thick. All beautifully carved, quite deep. Picture shows both sides of the same bead. Drilled ready to thread. Ideal as a pendant or focal bead. Select size from drop-down list. Technically, Cinnabar is mercury sulfide, found near recent volcanic activity. Its name comes from Medieval Latin cinnabaris; Red lead. 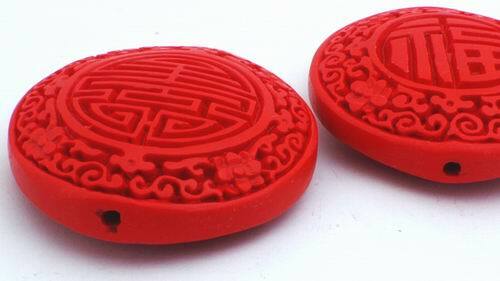 Because of its vivid red color, powdered cinnabar was used during ancient times for "war" and ceremonial face and body paint.